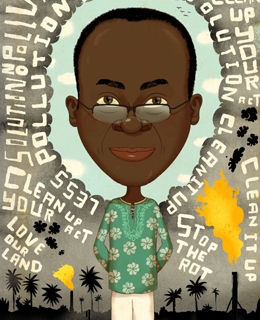 It wasn't an oil spill that made Nnimmo Bassey an environmentalist. It was a massacre  the 1990 assault by Nigeria's armed forces on the village of Umuechem, where residents of the oil-rich Niger Delta had accused the Shell Petroleum Development Company of environmental degradation and economic neglect. In two days of violence, 80 people died and nearly 500 houses were destroyed. "We woke up from a sleep and ... everything was collapsing around us," says Bassey, 51, head of Environmental Rights Action, the Nigerian chapter of Friends of the Earth. The deaths convinced Bassey and his colleagues that they needed to broaden their efforts. "We realized that if people don't have a safe environment to live in, then they don't have literally any other rights," he says. The petroleum wealth of the Niger Delta runs from the ground into government coffers and the accounts of foreign oil majors, leaving the region one of the poorest in the world. Its schools are crumbling. Its hospitals often lack doors  never mind modern equipment. Electricity, drinking water and employment are all in short supply. The oil itself doesn't always flow smoothly. Spills are common, all the more so because thieves tap into pipelines and angry villagers prevent infrastructure maintenance. If oil catches fire, it can burn for days. Bassey's group documents all these consequences and educates people about their rights. "Oil has been the destruction of the Nigerian economy," says Bassey. "It destroys the relation between the people and the state." In a country where 85% of government revenues rely on oil money, Bassey's positions often pit him against the authorities. Under the dictatorship of the 1990s, he was stripped of his travel papers and detained without trial several times. As the battle over Nigeria's oil wealth has turned into full-blown militancy, he has found himself on the same side as the armed rebels who have taken on the now democratic government in Abuja. While Bassey disagrees with the militants' tactics  kidnapping of oil workers, attacks on infrastructure, clashes with the military  he stops short of condemning them. "Any society that uses violence against its own people will eventually have a segment that stands up against it."